Day 18. Bounty. Baked Eggs and Potatoes Skillet Breakfast. 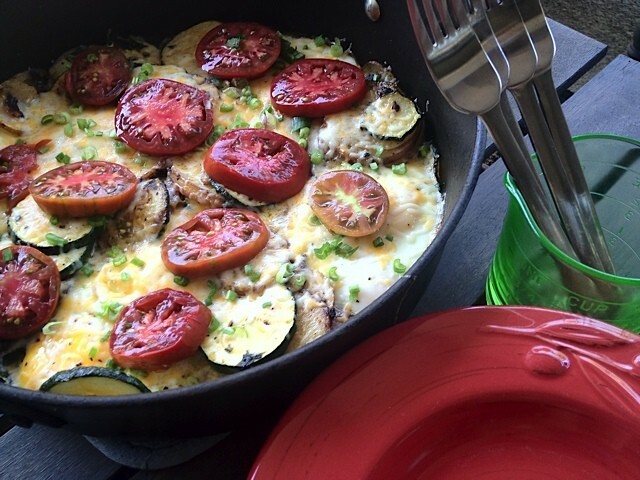 This Baked Eggs and Potatoes Skillet Breakfast recipe is made with garden potatoes, fresh tomatoes, shallots, green onions, cheese, zucchini, and eggs! Now that it’s autumn, our garden is looking old and tired. But we’ve produced so much and have shared the bounty with many this growing season. That feels good. With the variety of quality food that we put into our bodies, after 7 years with garden beds on our city lot, the ritual of harvesting has become an exciting part of our routine. Right now, it’s potatoes, tomatoes, shallots, and zucchini (and other squashes). But mostly warm, dirty, weird-shaped but mostly round, earth-scented potatoes. When our kids’ dad barbecues them and serves them fresh off the grill, you’d think our kids had died and gone to heaven. They are pure golden treats for all. 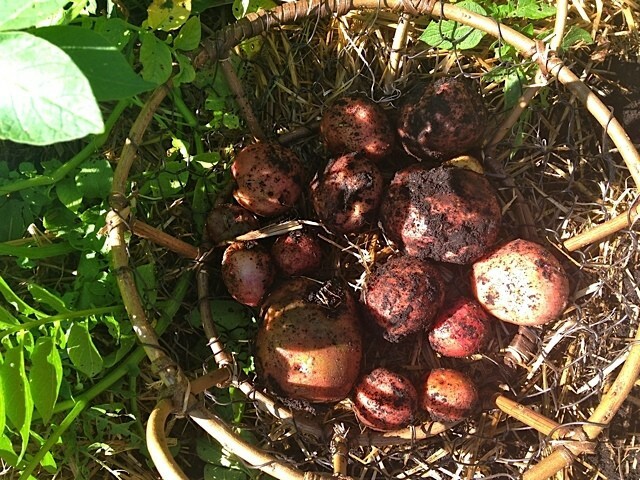 This time we dug potatoes from the garden beds, which we only dig up what we are going to use (they taste fresher that way, at least for now), sliced and fried in garden-fresh shallots. 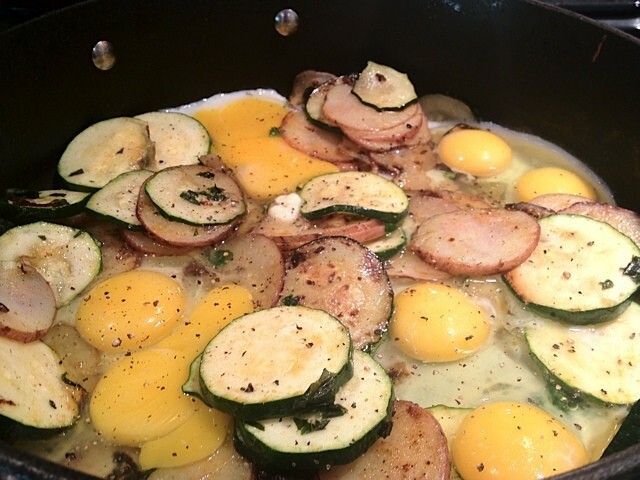 We made one of the simplest recipes, but truly nourishing to our bodies, Baked Eggs and Potatoes Skillet Breakfast. And to be honest with you, it was the conversation around the table that was really the treat. This week, 2 will be off to college and the home will be quiet and … different. The dynamics in our home will be changing. Just as the season is changing. And with the season, nourishment, love, and great joy. What favorite vegetables are you enjoying from the local market or your own garden this season? Add 2-3 Tbsp. 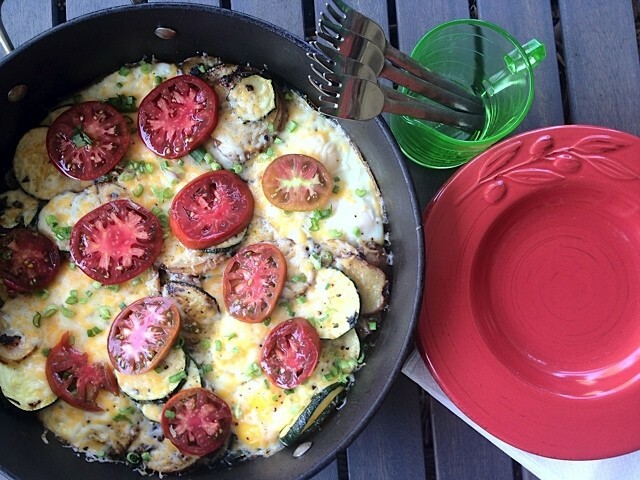 olive oil to oven-proof skillet. 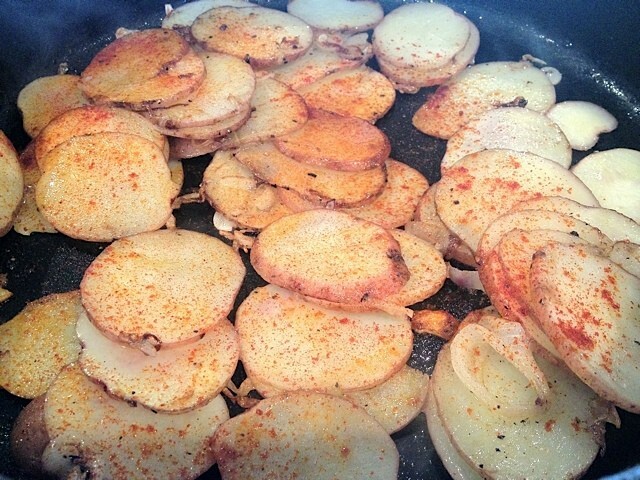 Heat on medium-high and add finely sliced shallots and the potatoes. Salt and pepper; add paprika. Cook, stirring occasionally until brown and tender (about 10-12 minutes). 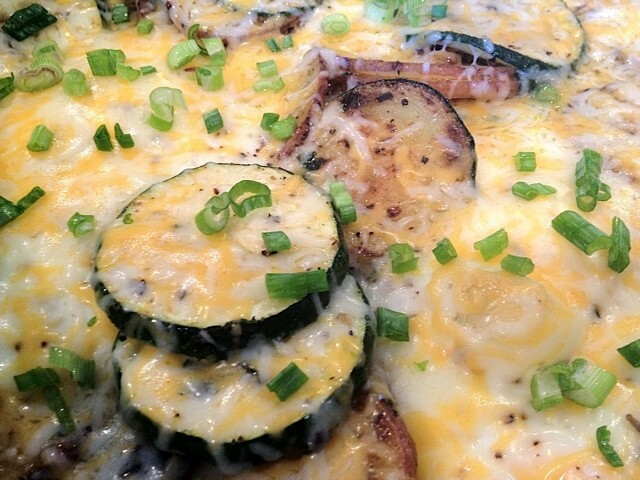 Add the sliced zucchini and cook for another 2-3 minutes, until tender. Add in the fresh chopped basil, removing the pan from the heat. Create 4 evenly spaced wells in the potatoes and add 1 tablespoon of butter in each well. Crack 2 eggs in each well, making sure you don’t break the yolk. Salt and pepper. 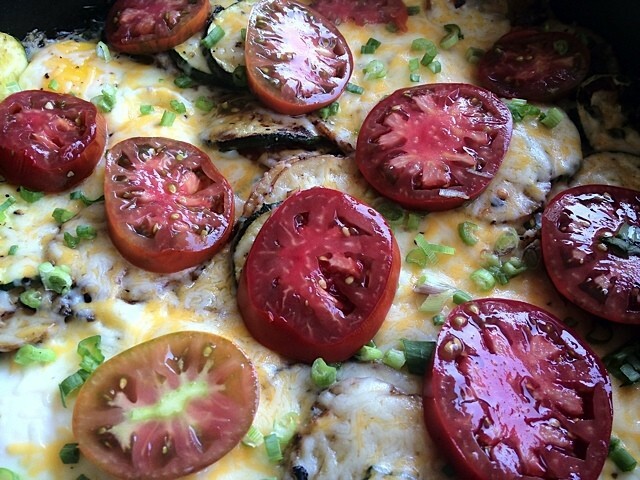 Place the skillet in the oven, without a lid, and bake for 10 minutes (until egg whites are baked through). Remove the skillet from the oven and sprinkle with 1 cup of cheese. Place back in the oven for 2 minutes. Garnish with sliced green onions and freshly sliced tomatoes. Next Post » Day 19. College. Pat’s French Toast. Day 7. Harvest. 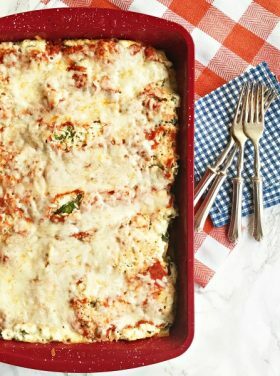 Make Your Own Lasagna. Your garden is so amazing! The drought has been really tough on mine this year. 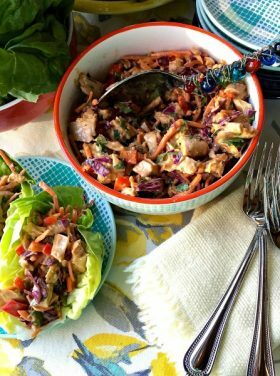 Oh my goodness, this sounds so yummy!!! Gracious, that looks fabulous! Can’t wait to make this for the guys. I also want to add that the post you had – I believe it was Patience – with the heartfelt story about the cab driver – had me in tears. It was a reminder that I really needed, as I sometimes rush too much and need a little tap on my shoulder from my Guardian Angel telling me to SLOW DOWN! After all, he can only fly so fast! LOL!!! Thanks so much for all you do and for always being “here”. You have no idea what an inspiration you are to me. PS – Did you get a chance to read Ben’s post about having dyslexia? If you know any kids with learning differences, send them his way. His story is so heartfelt and inspirational. This is so gorgeous, and I wish I had some of this harvest for dinner tonight! We live two blocks from the farmer’s market so I take big advantage of it. We don’t have enough space to have a garden either. I do love seasonal veggies! Unfortunately, I don’t have a vegetable garden, but my fresh basil plants are looking tired and yellowing, so I know what you mean. 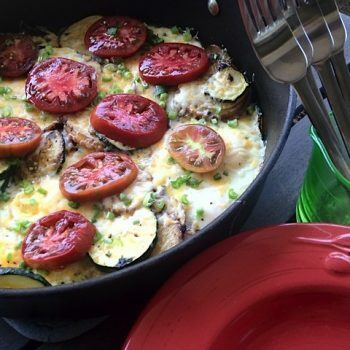 Your breakfast skillet looks so fresh and delicious, Sandy! It looks beautiful and homegrown makes it even more amazing. Those heirloom tomatoes are the perfect crowning touch. 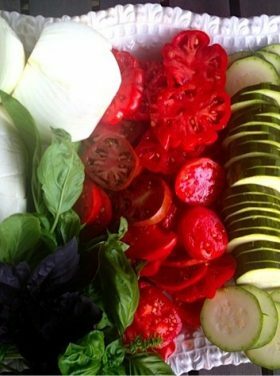 We’re loving all the tomatoes, zucchini, herbs, eggplant and butternut squash from our garden right now. Lots of ratatouille, salads and toasted tomatoe sandwiches. 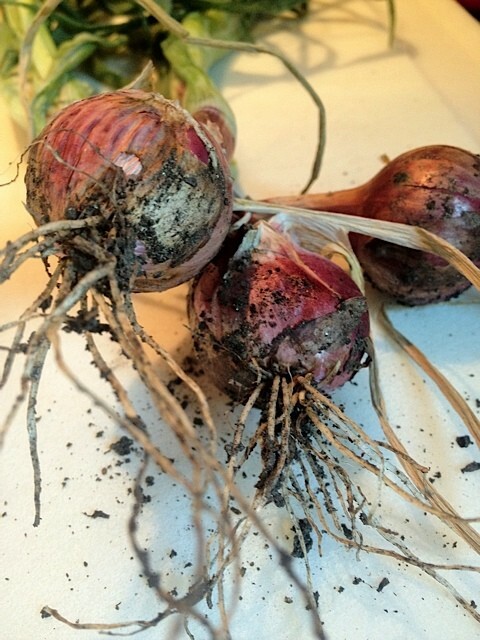 I also had shallots and garlic harvested earlier. 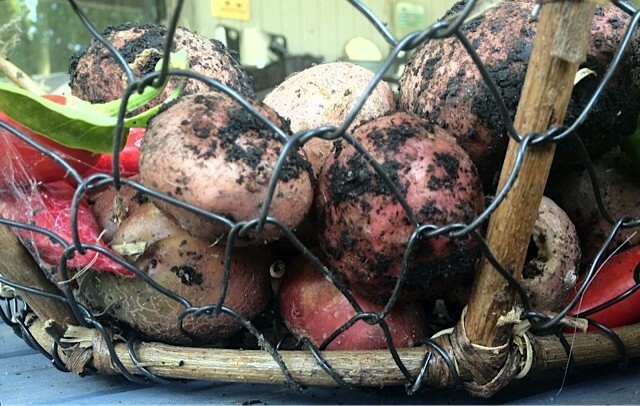 And because I just love those tiny little new potatoes, we harvested them in July and enjoyed every last one of them. It’s been many years since I had a vegetable garden and I’m loving every minute of it!